Discussion in 'Amps and Cabs' started by GAT, Mar 28, 2008. Well Shallbe has been touting the new Matchless King Cobra that he helped get off the ground. I've owned a Chieftain, SC30, Clubman, and the Phoenix in the past. I ordered the gray sparkle 1x12 combo from Stu at Fat Sound. As usual, it arrived in perfect condition today. Stu is incredible to do business with. So I plugged it in and grabbed my '07 Murphy Les Paul and fired it up. WOW!!! This amp is great, sounds like a real fat, articulate Clubman, with more gain and a slightly different voicing. It has a cool "bite" to the notes, think Mississippi Queen tone, but the amp is NOT shrill, but thick and fat with a nice rounded treble response. I used my Old World Esquire with a Budz pickup and that had the same kind of tone on those Youtube videos of Billy Gibbons at the NAMM show. The amp really responds to your picking attack and cleans up very well with the guitar's volume knob. The reverb really sits well and never gets overwhelming when cranking the amp. The trem is nice too, although I'll probably change the tube for that. I have a couple of nice EF86 tubes I haven't had a chance to use yet, but the amp sounds great stock. I love it with the volume all that way up and the first or second tone setting. Clean to scream. The only bummer is I have to leave to Scottsdale tomorrow for 3 days, ARGHHHGGG!! Anyway, thanks Shallbe for informing me about this amp and to Stu for making everything work out. Sounds super cool GAT! I was close to pulling the trigger on a Cobra Head & Cab but I had to sell my Bad Cat Trem Cat to fund it. After having several deals fall through I just decided to keep it. I am glad I did because I have digging it a lot now that I have been playing it everyday. The King Cobra does sound like a great amp though. I'm glad you like it. I had no idea how it would sound in a 1x12 format. That combo sure is beautiful. Your sonic desciptions are right on. I refer to the high end as a fat chime, and the amp has this thick, very rich, full sound to it. Like you, I play humbuckers guitars and and Esquire a lot through the amp---and I never change any settings. I like the second click down from the top, probably the same you refer to. A NOS ef86 does make it even better, IMO, as well a Mullard rectifier. Regarding the trem, I use mine pretty fequently, and do not want a volume drop off when clicking on the trem. I just recently started noticing this, and replaced the stock JJ's in the trem circuit and everything was back to what I love about the trem. Great for choruses in songs, ballads and slow tempo solos with gain. As great as the amp sounds, what I really love about it are the dynamics. I rarely touch my guitar volume knob now. With the amp turned up a good bit, I just play softer for a great clean sound, harder for more volume and gain. When I really dig in, it just gets bigger and louder, without ever taking your head off with shrill frequencies. Enjoy! Phil has designed a very, very special amp in the King Cobra. I'll add to the general Matchless excitement. I had a 1x12 Chieftain Reverb Combo arrive today. I just couldn't swing the ticket price for the King Cobra right now. I'll add to it as well! Cool to hear everyone is digging the new Cobra series! Congrats GAT!!! Great stuff! I've become a bit of a Matchless addict lately. I recently added another Chief head and an HC-85 (both stellar transactions from fellow TGP members)! Absolutely amazing stuff! These amps are truly special! And, now I just added a pristine Sampson era 4x12 straight cab (G12H30s) that just arrived today! I'm eagerly anticipating getting home and rocking out this weekend! Hey guys, I'm back from Scottsdale. Monday night we have rehearsal and I'll hook it up to my Bradshaw pedal board. Can't wait. I wish I had the ability, equipment and time to make some nice clips, but I don't. One day I may join the digital age. "Clubman with more gain?" Sounds very interesting. WOW! I rehearsed tonight and can't believe how cool that amp is! I used my Esquire, Murphy Les Paul and Vinetto Strat. The Bradshaw system had a Fetto, a BFJ RRB boost, a 200 lbs. fuzz, and a few other things. I also have a Scalpel to cut volume. So, for cleans on the Paul I used the Scalpel to cut volume so that the amp was pretty clean, without it it got a gain similar to Robben Ford. I would add the RRB for the gainer stuff. For the neck pickup tones I would do the same, but also used a Boss/Sniper EQ to add a bit more bite and to thin the lows a bit. Same thing, it sounded killer. I could get those Derek Trucks tones and then morph into the Jimmy Herring gainy tones. For the Strat and Esquire, the amp with no pedals sounded perfect. It had that killer one the edge clean tone. Add the RRB and it was just thicker and then add the Fetto and there was that over the top Texas lead tone ala Phillip Sayce. The TC2290 was in the loop and that worked great too. Man, I tell you guys, this is a dream come true. The other cool thing is that with the amp volume set at 2:00 it's pretty loud, but it works flawlessly with a Komet Airbrake. No tonal difference. Shallbe, I also use the second from the top click and that works well for all guitars. I am a believer. I also don't think it sounds quite like a Clubman now, it is much more articulate at higher gain tones and there are ZERO ice pick tones. I use the Cut at 12:00 and it just rounds off the highs a very slight amount. The band LOVED my tone tonight. Everything from cleaner Tommy Castro tones to heavy Bonamassa/Sayce tones. Thanks for the cool report. Your experience echoes mine. I also have the cut set at noon (as well as the reverb). I don't think the amp sounds that much like a Clubman either---it has its own thing going on. It was supposed to sound like a combination of sorts of both channels of the Phoenix, but richer. The King Cobra is articlulate and dynamic without being harsh or tough on the ears. When gainy, it is not mushy and the bottom stays full. Volume-wise, the amp somehow excells at being at the right level to make me, my bandmates and the clubowners happy. It is hard to describe, but I have never gotten so many compliments on my sound as I have in the last year and a half. It just fits. I run my amp at 9-10:00 volume wise and use a 2-stage boost for most dirty work. The clean tones are the best I have ever had, and the clean sustain on chords is unreal. For serious gain, I step on my CJOD. It loves pedals out front like univibes, chorus, delay, etc. and for me, has taken my effected tones to a new level, It all sounds better. What speaker is in the 1x12 combo? Whats ohms are you running? Just curious, as I'm using a 16 ohm 2x12 cab. That should be illegal, I think . I'm speechless with envy ...speechless . . It is running an 8 ohm "Matchless/Celestion" G12H30. I usually don't like these but it really sounds good in this amp, plus its not broken in yet. I had a Phoenix but it had a harshness to my ears which the KC does not. I will try it later with a THD cab w/Blues and a THD w/G12-65s. I think I sold you that Phoenix. I hear what you are saying about the upper end of the Phoenix, and I compensated for it a little by running both channels together with different eq settings. It still wasn't as pleasing sounding as this amp. It will be interesting to hear how it sounds through the different speakers and cabs. Cool story and description!! Any pics?! This is a picture of my prototype before the name change to King Cobra. GAT's amp is in cool sparkle tolex and a combo. I saw a picture of it on Fatsound's website. I picked up a Klon (3rd one I've had) and put it in my draw. MAN!!! For strats it is killer with the King Cobra. Articulate, fat, and just sings! Really digging this amp. Sweet! I gotta try (or get one!) a Klon one of these days! I jammed on my HC-30 through the EF-86 channel tonight with the Clark Gainster as a boost and my jaw dropped! 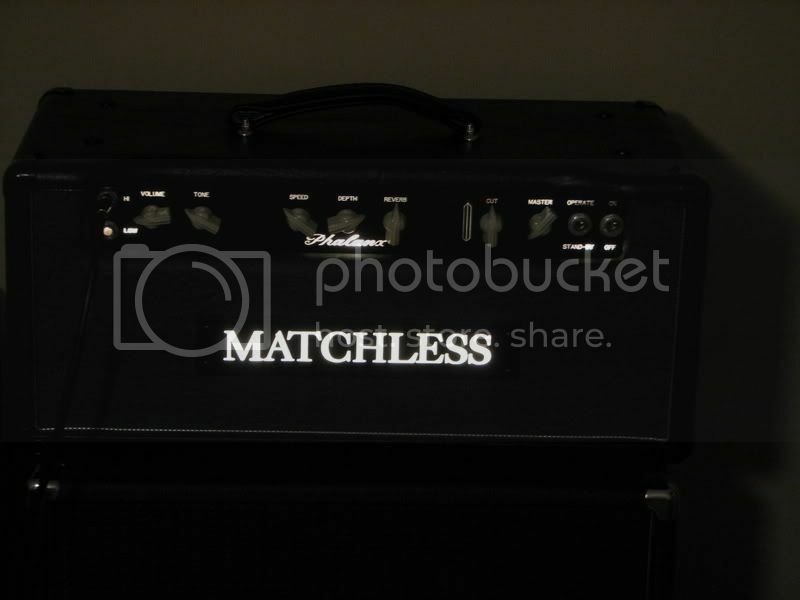 I can't say enough good things about Matchless amps! And, I just picked up a Sampson era 4x12!! Sweet! I gotta try (or get one!) a Klon one of these days! Never played a Klon, but I'm enjoying both my Fulldrive II and OCD with my Chieftain. They both work really well for some different flavors of cranked. What's nice is they replicate the Chiefy's own cranked up sound very well.